Glasses by Gearbox and Head are among our top picks. While pickleball has become my passion in recent years I do still play racquetball once a week with friends. While I am slowing down with age and spending more time with a pickleball paddle in my hand I do still enjoy the challenges of sports like squash and racquetball – there is something about the walled-in court that and the hand-eye coordination of timing the bounces that keeps me going back. Most of the time (weather permitting), I’m on the outdoor courts wearing tennis sunglasses. However, for indoor pickleball or racketball, I switched to these clear protective glasses by Gearbox. 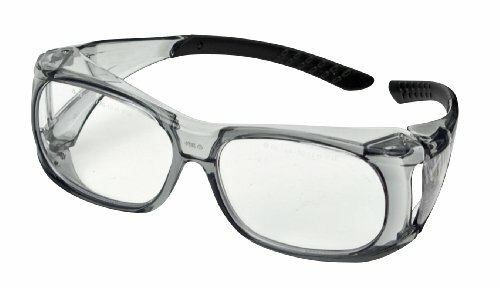 Best Protective Glasses to Wear Over Prescription Glasses? These clear glasses by Gearbox Sports, and take the top spot for our best pick protective glasses. Gearbox is a well-known equipment brand for racket sports. Originally a racquetball company – founded by a professional racquetball player and expert in composite materials manufacturing, the company made a name for itself with several patents for racquetball gear, since then they have expanded into paddleball and more recently pickleball. These polycarbonate lenses are coated with an anti-scratch and anti-fog layer. While I use the clear lenses, they do also come in amber and smoke. The protective glasses are pretty straight forward design with a semi-rimless (only upper half of lenses are framed. This type of design is good for sports since there are no solid frames on the bottom have, blocking less of your line of sight and giving you a wider clear angle to see the entire court and ball bouncing up from below or the sides. These also come in amber and “smoke” (grey) lenses, which are nice options if you plan to wear them outdoors or under bright florescent lights. 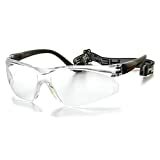 This pair of “Impulse” protective eyewear is also made of shatter-proof Polycarbonate. The main differentiating feature between these and the previous glasses from Gearbox is the convenient clip-on strap that helps give a snug fit around the back of your head and secures the glasses from falling off during an intense game. Head makes these specifically with racquetball players in mind but they would be a good match for any racket sport. This is another feature to consider if you sweat a lot and you tend to notice nose piece slipping- either sliding down the bridge of your nose or side-side movement. The strap is adjustable to help keep the eyewear in place regardless of your head shape or size. The next pick on our list are these sports goggles from Ponosoon Sports. These are more complete safety protection goggles. 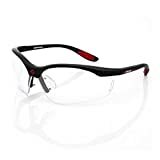 They have a larger profile and heavier duty full frame give them a more robust look and feel compared to the light and small profile eyewear by Gearbox but they do deliver more all-around protection. Apart from the chunky look to these glasses, they are made with lightweight polycarbonate lenses and frames to keep the overall weight down. The hard frame fully covers all around your eyes and has a wide temple protector also. The adjustable strap helps keep these snugly fitting to your head and are a good option not only for racket sports but also well received by people who play basketball, volleyball and other sports- especially for players (and parents) looking to protect eyes after some type of injury (or eye surgery) where they are looking for an extra layer of protection compared to an open frame. Kids also seem to like the softer rubber notepad. These are NOT designed to be worn over prescription glasses but the lenses (width 53.5mm the hight 41mm) could be replaced by a prescription lens (you’d need to take them to a local optical shop to get them fitted with your prescription). This pair of Head eyewear also made our list of top eyewear. While the design is similar to the other pair of Penn/Head glasses we reviewed above (the Impulse), these have a slightly sleeker design and pointed profile on the outer edges of the lenses. The other main difference is the ventilation design. The Power Zone glasses have a series of vent holes along the whole length of the bridge. Like the Impulse, these also come with an adjustable clip-on elastic strap to keep the glasses in place during play. There are some complaints by buyers that after some period of use the protective coating on the plastic frames can peel and crack. These uniquely designed glasses by Ektelon excel at ventilation. They have vent holes all along the brow of the frames and an open side design that lets air-flow freely through the eyewear. The “AirFlow” shield design is designed specifically to maximize the flow of air and prevent the glasses from fogging up. Many buyers have (even those that sweat a lot and have had problems with other glasses fogging), that these really do not fog. 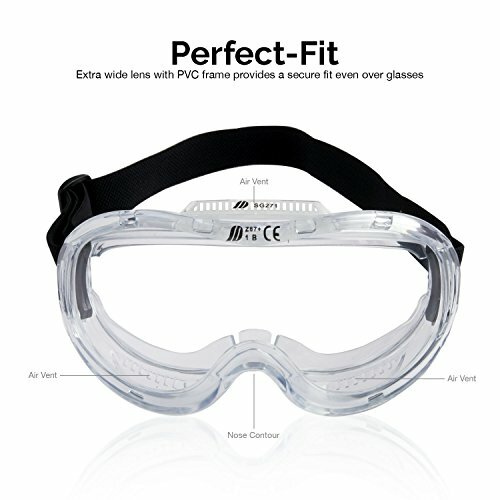 The design of these protective glasses is very simple, one-piece clear plastic design with simple nose pads. The real feature here is the ventilation design. 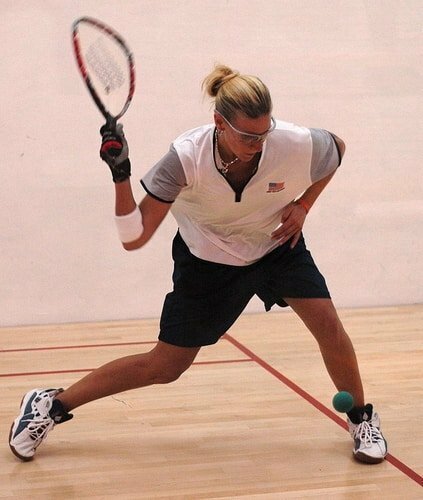 Ektelon makes a wide range of eyewear for racquetball does have other models, styles and colors. This is one of the most simple designs but if you’re looking to minimize the chances of your lenses fogging up then this is the one I’d look at. Only comes in clear design. Large Enough: Unfortunately, a lot of protective eyewear is marketed as being appropriate to fit over glasses but often times that is far from the truth. Goggles that are too small will be uncomfortable and trying to squeeze your glasses under a small pair of goggles you’ll just end up being miserable and possibly just having to take them off mid-game. Common problems are the frames putting pressure on your temples and/or nose bridge, digging into your skin or even causing headaches from the pressure. Wide-Enough: Apart from the overall size of the frames, they need to be large enough to give you an open field of vision and not obstruct the view any more than your prescription glasses already do. Several years ago I had Lasik surgery on my eyes so no longer need goggles that go over my prescription glasses. I feel lucky now that I don’t have to deal with this issue but even when I did wear glasses I was NOT able to find good quality goggles designed for racket sports AND also specifically made to be worn over glasses. So while researching I gave up on finding the perfect solution and opened up to the possibility of finding any kind of protective eyewear. While it might seem strange to wear shooting specs for racket sports, these “Over Spec” protective glasses actually seem like a pretty good match to me. 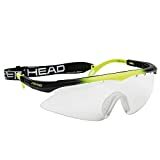 They are made specifically to fit comfortably over prescription framed glasses and are made of scratch-resistant lenses and are designed with distortion-free lenses (for accurate shooting) which is also an added benefit for any sport involving hand-eye coordination (basically every sport on earth). They have a comfortable fit and are made to be worn over any standard prescription eyeglasses. The slip-resistant materials is also a nice feature since it helps hold to your head even when sweaty. From a safety standpoint, these goggles exceed most sporting glasses because they are made for shooting: the ballistic rated lenses give up to four times greater impact protection than ANSI Z87.1, and also comply with military standard MIL-PRF-31013. 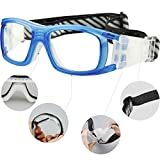 The other place I looked was just general safety goggles (not specific to racquetball, squash or other racket sports) and found these Wide-Vision Anti-Fog Safety Goggles by Neiko. While they are not really made for sports, I don’t see any reason for that to keep you from trying them out. The key factor that many users praise is they really do a good job of not fogging up and they have such a wide coverage that your prescription glasses have plenty of room inside without losing any peripheral vision. Apart from that the soft wrap-around PVC frame and the adjustable strap are comfortable and lastly- they are very inexpensive, much less than other “sports goggles” we found that were marketed as being designed for “over-glasses” but really weren’t. If you wear prescription glasses, you may want to look at the which are ample enough to comfortably fit over pair of glasses and vent well enough to prevent them from fogging up. Hopefully, these two pairs that we’ve narrowed down help you find a pair that works for you. If you’ve played pickleball, racquetball or squash long enough you’ve most likely been hit by the ball at some point (if not on many occasions). When it does happen, I most often I get hit somewhere in the upper body (torso, chest, and head). I would rather look a little dorky playing with my protective goggles that get blasted with a pickleball to the eye so when I play indoors I wear clear protective glasses. Some people make comments that I look silly but to me, it seems totally normal to wear eye protection- maybe it’s just because I grew up playing racquetball where protective eyewear is just a standard accessory. My guess is that as pickleball becomes more competitive, getting hit with the ball will become more of an issue -since I tend to see more people getting whacked when watching advanced players compete. Unfortunately, it also puts a damper on the game if you are constantly worrying about hitting your opponent or getting hit-it could easily solve the problem and probably increase game intensity if everyone wore eye protection and we didn’t have to worry about getting hit or taking someone’s eye out!